Hi Marie! I have a question: I've got a vintage drafting book (1969) with some pretty fabulous gems in the illustrations - would drafting and sewing up something from the book, even though it's not really a 'pattern' count for Vintage Pledge? Excellent pledge, I'm really looking forward to seeing what you make! I'll have to think what to do for my pledge. Love the button - I take it Charlotte's been hard at work again? Please do add me to the pinterest board. yay, so glad this is back and have grabbed a button. Will be blogging in the next week what I'm going to pledge to make! I've definitely been thinking what to make this year already but I think a part of my pledge will be to finish of a bunch stuff I started last year, have a few dresses and shirts that need finishing. looking forward to seeing everyone's makes. I'm so happy you are able to bring back the vintage Pledge this year! Thank you for all that you do and to Charlotte for the beautiful button. I, Paula Haven, pledge to sew two vintage patterns from my existing collection. Aaaw, thank you Paula...thanks for joining in! Yay! Happy to have you on board again Akram! Oh my. The 'vintage' Butterick pettern 5428 is the pattern I used as the white jersey underdress beneath a lace overlay with long sleeves and train (made from my mother's wedding dress pattern) and cut away at the front in a curve to reveal the skirt of the underdress. Thes result was stunning. 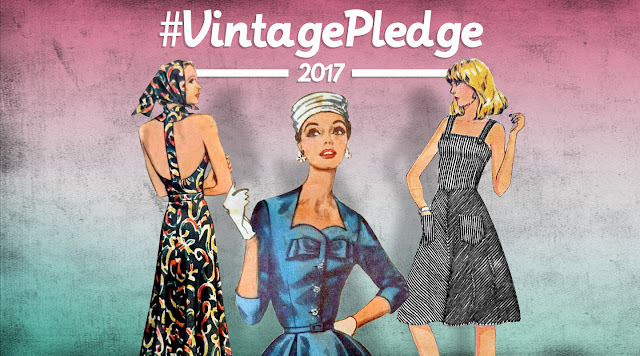 Blogged my pledge here: https://www.revivaldesigned.net/the-2017-vintage-sewing-pledge and have joined the pinterest board. HEEEEY GIRL, I've been unofficially vintage pledging so far but would love to make it official. Let's say that I'll sew 10 vintage patterns this year. I'm going to change it up for myself this year and not set a specific number of vintage patterns. Instead, I pledge to sew a vintage capsule wardrobe - top, bottoms, casual, outerwear, something fancy, not really sure exactly what. But a range of different things. Oh my...what a fantastic idea!!! Can't wait to see your vintage capsule wardrobe!!! It's not the quantity that matters :o) Delighted you can join in again! I think joining in would make sense seeing how I have two drawers filled with vintage patterns! Hi- I feel like I just found my people! I would like to participate in the #VintagePledge. Is it too late to join? Please let me know- so excited! I joined last year but don't really use pinterest anymore, do you need to post to pinterest or is Instagram alone ok? Thanks Marie! I'd love to join in again - hopefully I'll be a bit more productive this year than last though! I'll blog my pledge today, just aiming to sew (or FINISH sewing) garments from 4 vintage or repro sewing patterns this year. Thanks so much for joining in Gabrielle!!! I would like to join! I have already made one maternity dress from a vintage pattern, and I'm working on a second. And I have plans for vintage baby clothes! :D Please add me to the Pinterest board - my username is Sartorial Statement. Thanks! This looks like a lot of fun. Am a bit late in pledging, but better late than never, is it not? I am pledging to make at least two vintage garments this year. I have a stash of vintage patterns I have been itching to get into. I pledge to make 2 garments form vintage patterns. I'm so excited! Im in! This sounds like fun! As I have a lot of vintage accessory and toys patterns I pledge to make at least one of these during this year. I will also knit one menswear garment from vintage pattern. I'm jumping into the Vintage pledge! I plan to finally make two vintage patterns from my stash. 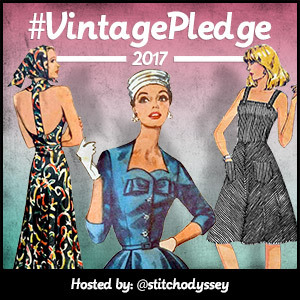 I have decided to join the vintage pledge late in the game seeing that my next 4 makes I'm planning are vintage!